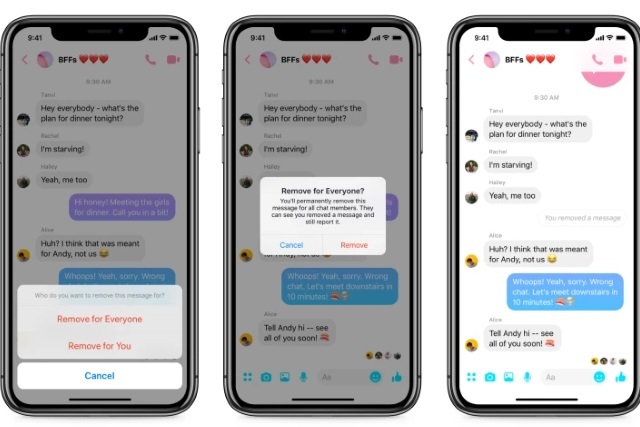 Facebook said some time ago that it would be bringing an "unsend" option to Facebook Messenger, giving users the ability to delete messages they change their mind about. Today is the day this feature finally appears with the addition of a new "Remove for everyone" option. While this will be welcomed by Facebook Messenger users, it will not please everyone; as well as there being a time limit on when messages can be deleted, there is no stealth deletion option as all chat participants are informed when a message is removed. Simply tap on the message you want to remove and select the option to "Remove for Everyone". The removed message will be replaced by text alerting everyone in the conversation the message was removed. You will have up to 10 minutes to remove a message after it is sent. If you want to remove a message just for yourself, you can still do that anytime by selecting "Remove for You". When you choose this option, the message will be removed for you, but not for anybody else in the chat. So while you can now easily delete a message that has a typo in it, or remove something typed in anger that you quickly regret, the new unsend option does not enable you to delete messages from older chats.